Pipeline from the Missouri River to supplement #ColoradoRiver Basin supplies? “We created the largest artificial watershed in the world,” says Pat Mulroy, the powerful head of the Southern Nevada Water Authority, a wholesaler that supplies Las Vegas. Some of New Mexico’s share goes into the Rio Grande, eventually flowing south and east through Texas and into the Gulf of Mexico. What Denver returns to nature flows into the South Platte, a tributary of the Missouri River. The coastal cities of Southern California dump a good bit of their diversion into the Pacific Ocean. The river’s web, if some have their way, could become even larger. John Kaufman, the man who proposed the Missouri River pipeline, wants to see the artificial boundaries expand. Kaufman is the general manager of Leavenworth Water, which serves 50,000 people in a town that welcomed Lewis and Clark in 1804 during the duo’s westward exploration. The identity of the pipeline’s proponent, who was anonymous during the Bureau of Reclamation study and is for the first time being named in the media, is important because of where he lives — outside of the natural Colorado River Basin, or in the extended web. In Kaufman’s vision, Kansas becomes a hydrological keystone for the West, facilitating water transfers that could affect at least 10 states and Mexico. “We’d hopscotch water across Kansas and sell it to communities in the state,” Kaufman told me during a phone interview last month, explaining the benefit to his home territory. Construction of the pipeline would also supply jobs to Leavenworth, where the intake facilities would be located. At least one groundwater district in western Kansas is advocating for a similar concept, a Missouri River pipeline to the High Plains to compensate for declines in the Ogallala Aquifer, an essential source for irrigation. Kaufman has presented his idea to state and local officials several times this year. Once the water flows past Kansas, “it’s a horse trade,” Kaufman said. Water delivered to the Front Range would be earmarked for the South Platte River Basin, which includes Denver. 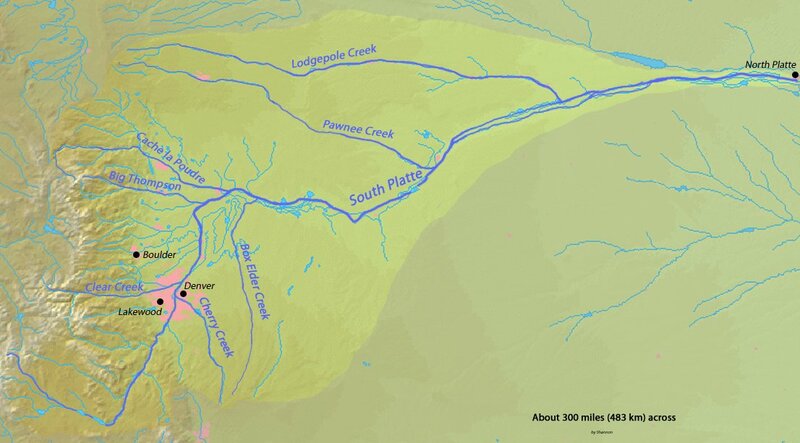 (The South Platte, remember, is part of the Missouri River Basin.) A pipeline would close the circle, sending South Platte water, via the Missouri, back uphill. Of course a few drops of the Colorado would be in the pipe, too. Then there are the swaps. Front Range cities get roughly 72 percent of their supplies from the Colorado River, according to a 2009 study commissioned by the Front Range Water Council. If water from the Missouri were imported, then some of the trans-Rocky diversions could remain within the Colorado River Basin. Kaufman’s idea — he calls it the Eisenhower Pipeline, in honor of the sponsor of the interstate highway system, which got its start in Kansas — was included in the Bureau of Reclamation’s final report, but top federal officials distanced themselves from the project, once word leaked a few days before the report’s official release last December. “In my view, [water import] solutions are impractical and not feasible,” said Ken Salazar, Secretary of the Interior at the time. The study actually gave the pipeline high marks for technical feasibility, but the $US 8.6 billion price tag and the high energy costs pushed the pipeline to the bottom of the pile. Conservation was the big winner, deemed to be significantly cheaper and able to deliver more water. Kaufman knows the scheme is expensive, which is why he says that he needs financial buy-in from the states in the Colorado’s Lower Basin and cooperative agreements among all the Basin states in order to shuffle water supplies. More Missouri River Basin coverage here and here. Rose Davis, a spokeswoman for the Bureau of Reclamation, said that during the course of the study, the analysis done on climate change and historical data led the agency “to an acknowledged gap” between future demand and future supply as early as the middle of this century. It is unclear how much such a pipeline project would cost, though estimates run into the billions of dollars. That does not include the cost of the new electric power that would be needed (along with the construction of new generating capacity) to pump the water uphill from Leavenworth, Kan., to the front range reservoirs serving Denver, about a mile above sea level, according to Sharlene Leurig, an expert on water-project financing at Ceres, a nonprofit group based in Boston that works with investors to promote sustainability. If the Denver area had this new source of water to draw on, it could reduce the supplies that come from the Colorado River basin on the other side of the Continental Divide. But [Burke W. Griggs] and some federal officials said that the approval of such a huge water project remained highly unlikely. Ms. Leurig noted that local taxpayers and utility customers would be shouldering most of the expense of such a venture through their tax and water bills, which would make conservation a more palatable alternative. More Missouri River Reuse Project coverage here. A pipeline from the Missouri River to Colorado’s Front Range has the potential to bring water to two states — and into the Arkansas River basin — but has not been on the table in Colorado water discussions. The Missouri River reuse option is being considered as one of about 100 proposals that would relieve pressure on diversion of water from the Colorado River basin. The Bureau of Reclamation began the study in 2009 to assess future supply and demand along the Colorado River and a final report should be coming out this month. Pueblo and other Front Range communities import water from the Colorado River basin each year, so new supplies could reduce that demand. 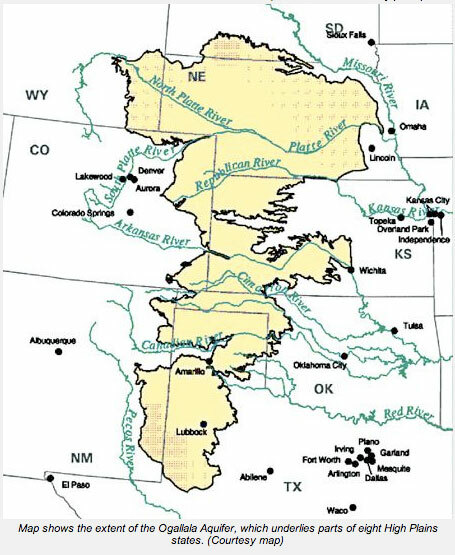 The reuse would provide water to depleted aquifers across Kansas through diversion of up to 600,000 acre­feet annually from the Missouri River near Leavenworth, Kan. A description of the project on file with Reclamation indicates some of the water could reach the Arkansas River basin, north of Colorado Springs. It’s unclear from the documents available if the proposal has a sponsor. Although specific plans to move water from Flaming Gorge and the Mississippi River, as well as more general options from the Missouri River, have been debated, the Kansas­Colorado plan has eluded discussion within Colorado. “No, we have not talked about it,” said Gary Barber, chairman of the Arkansas Basin Roundtable. Barber also represents the roundtable on the Flaming Gorge Task Force, which has not reviewed the idea. Bureau of Reclamation officials on Tuesday said the “Missouri River Reuse Project” will be evaluated for feasibility following the release in coming weeks of a federal government study on water supply for the West. 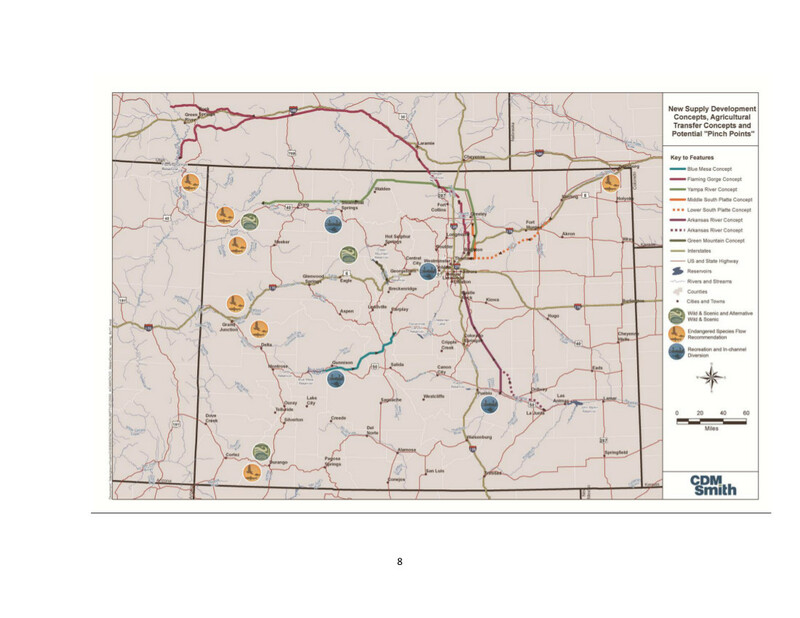 The Missouri diversion described in Bureau of Reclamation documents would require a pipeline across Kansas, with water used to fill surface reservoirs and recharge depleted aquifers along the way to metro Denver. It would convey 600,000 acre-feet of water a year depending on Midwestern needs. An acre-foot has been regarded as enough water to sustain two families of four for a year. The options for importing water reflect widening worries about future shortages. The Colorado River Basin, which spans Arizona, California, Colorado, New Mexico, Nevada, Utah and Wyoming, is the source of water for 30 million people. The government’s three-year Colorado River Basin Water Supply and Demand Study has found that within 50 years, the annual water deficit will reach 3.5 million acre-feet. Bureau of Reclamation officials said their primary purpose was to define current and future imbalances in water supply and demand. They asked stakeholders and agencies across the seven basin states to submit ideas to prevent shortages. States have agreed to consider a Missouri River diversion. Other ideas are destined for an appendix. The Missouri River Reuse option is a diversion of up to 600,000 AFY of water from the Missouri River for reuse within the Missouri River Basin of Kansas and Colorado. Water would be diverted from the Missouri River only when flows to support navigation and municipal water diversions along the river from Leavenworth, Kansas to Saint Louis, Missouri, are not impaired. 1. Within Kansas, the water would be used to fill surface reservoirs and recharge depleted aquifers in the upper and lower Republican River Basins, Solomon River Basin, and Smoky-Hill/Saline River Basin as determined from assessment of need and feasibility by the Kansas State Water Office in cooperation with the Kansas Division of Water Resources, Army Corps of Engineers, and the States of Colorado and Nebraska. In particular, the water would be used for irrigation and municipal, commercial, and industrial use and to recharge the Ogallala aquifer in western Kansas. Each of these basins (including the Ogallala aquifer in northwest Kansas) is tributary to the Missouri River. The Ogallala aquifer discharges into the Republican River in northeast Colorado and northwest Kansas. Kansas may choose to construct new reservoirs or enlarge existing reservoirs for the project. would be used for municipal, commercial, and industrial use with return flows allocated for agricultural irrigation use within the South Platte River Basin (a tributary of the Missouri River). Some water could be used to recharge the bedrock aquifers of the Denver Basin. In eastern Colorado, some water could be used for irrigation and municipal use and to recharge the Ogallala aquifer. Water would likely be stored in Front Range reservoir such as Rueter-Hess, Carter, Barr, and Chatfield and in designated alluvial storage along the South Platte River. Colorado may choose to construct new reservoirs or enlarge existing reservoirs for the project. Colorado and Arkansas Rivers in Colorado and nontributary Denver Basin ground-water withdrawals). Some of this water could be directed to the Arkansas River in western and central Kansas and in eastern Colorado beginning near Colorado Springs. Some water could also be directed to the headwaters of the Colorado River Basin through pipelines and tunnels when there is great need to relieve drought in the basin provided the navigation and municipal supply flows in the Missouri River are plentiful and other water needs of western Kansas and eastern Colorado are being reasonably satisfied. The location of the Missouri River diversion point is in Leavenworth County, Kansas near the City of Leavenworth. The water would be treated and disinfected at a large treatment plant to be designed and constructed, as necessary, for subsequent conveyance and use. End-user treatment, such as water softening for municipal, commercial, and industrial use, is anticipated. 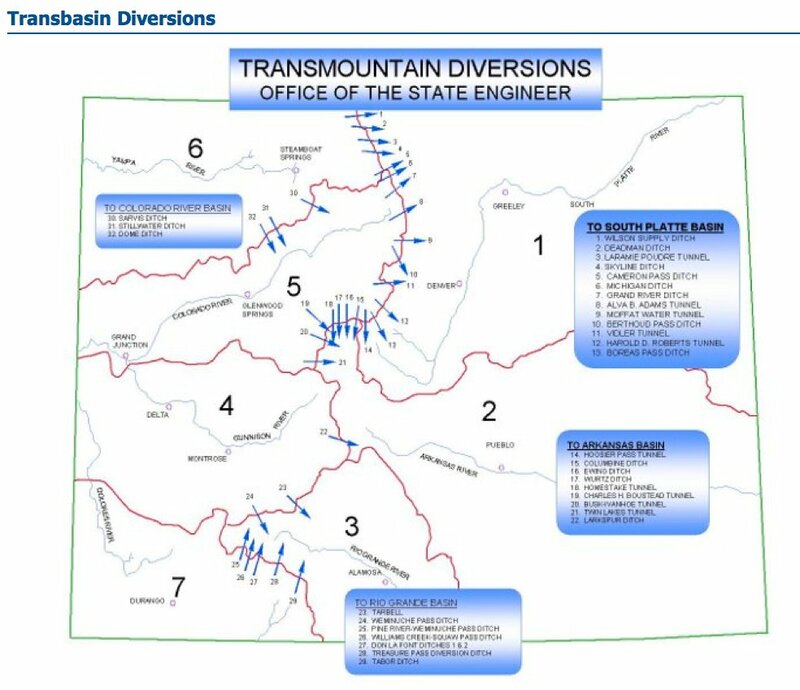 The Missouri River Reuse Project is technically feasible as evidenced by other large diversion projects in the western United States including, but not limited to: (a) the numerous transmountain diversion projects in Colorado that bring tens of thousands of acre-feet of Colorado River and Arkansas River water to the Front Range through numerous tunnels; (b) the Colorado River Aqueduct that brings water from the Colorado River at Parker Dam to Southern California; (c) the Los Angeles Aqueduct that brings water from Owens Valley to Los Angeles; (d) the Central Arizona (canal) Project that brings Colorado River water to Phoenix and Tucson, and (e) the State Water Project of California that provides irrigation water to farms in the San Joaquin Valley, and is a major source of supply for cities in Los Angeles, Riverside, San Bernardino, and San Diego Counties and other parts of southern California. Many of these projects involve the Bureau of Reclamation, Corps of Engineers, and numerous state water resources agencies. A similar serious project has been proposed that would divert surface water from the Mississippi River and pump it west into the Colorado River Basin. Another large project has been proposed that would divert about 300,000 of acre-feet of surface water from the Green River at Flaming Gorge Reservoir in southwest Wyoming, pump the water across southern Wyoming along I-80 to Cheyenne and then south into the Denver Basin. Moreover, private energy and pipeline companies have constructed thousands of miles of interstate pipelines that pump vast quantities of natural gas and petroleum products across the United States. Legal, engineering and construction costs need to be determined for numerous possible options. Construction costs will likely be in the billions of dollars and would be borne by the various end users — water providers and irrigators in Kansas and Colorado with some participation by the Corps of Engineers and Bureau of Reclamation. Operating costs must be affordable for irrigators and municipal users for the project to be feasible. In exporting water out-of-state to Colorado, Kansas could charge and collect a reasonable severance tax, as well as the State Water Plan fee. 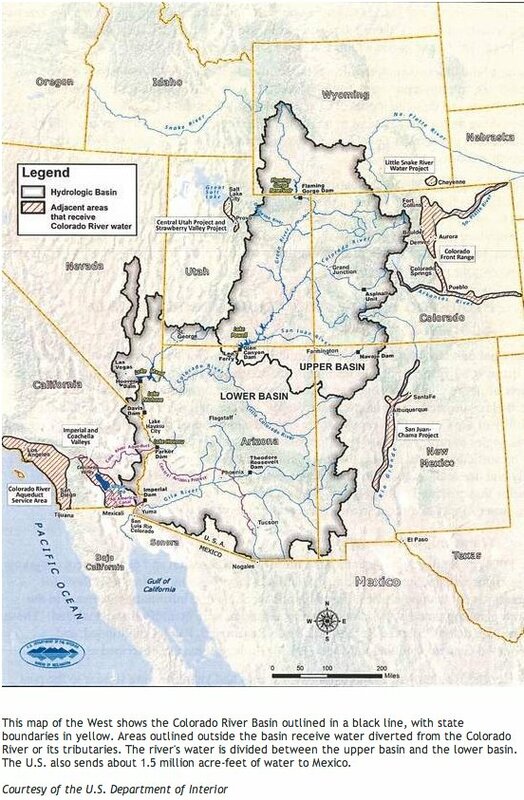 The historic 2007 multi-state agreement among the seven Colorado River Basin States governing the future management of the Colorado River provides for the introduction and recovery of non-Colorado River system water and non-Colorado River system water exchanges. The Front Range of Colorado uses about 345,000 acre-feet of Colorado River water each year and releases that water into the South Platte River Basin, which is tributary to the Missouri River. According to the 2004 Colorado Statewide Water Supply Initiative (SWSI) report, the South Platte River Basin will need an additional 409,700 acre-feet of water by 2030 due largely to forecasted population increase. Bringing Missouri River reuse water to the Front Range provides an opportunity for Colorado to exchange all or a portion of this water for other water in the Colorado River Basin originating in the State of Colorado (such as from the Yampa, White, and Green Rivers) to the Lower Basin states. This exchange of water would engage the States of California, Arizona, Nevada, and New Mexico in helping to pay for the project. The federal government would also have a financial interest in the project because of the Colorado River treaty with Mexico. The Missouri River Reuse Project could have major interstate impacts on regional and local water supply. Congressional and state legislative approvals will likely be needed with an accompanying environmental impact statement under NEPA. A 404 permit will be needed from the Corps of Engineers including numerous state approvals. Water rights for the diversion will have to be obtained from the Kansas Department of Water Resources and will be held by a Kansas entity. Even though the water will be used in Kansas and Colorado, the reuse project will likely have profound and unprecedented positive impacts on the Colorado, Republican, and South Platte River compacts affecting Kansas, Colorado, Nebraska, Wyoming, Utah, Nevada, Arizona, New Mexico, California, and the Colorado River treaty with Mexico. The reuse project could also positively impact the North Platte and Arkansas River compacts involving Kansas, Colorado, Nebraska, and Wyoming. The State of Missouri will need solid assurance that the flows in the Missouri River will always be sufficient to support navigation and municipal water diversions in the state. A benefit to the states of Missouri and Kansas and Kansas City area water providers is the possible reduced risk of damage from flooding and river degradation. The project has numerous options that can be considered in terms of design, construction, operations, and costs. Each of these options needs to be fully explored, which will take time and money. The possible source(s) of funding need to be determined and evaluated. The project is large and will need to engage the cooperation (buy-in) and participation by numerous states and their respective water resources agencies and water providers, the Corps of Engineers, the Bureau of Reclamation, and various Missouri River stakeholders. Other federal agency cooperation will be needed from the Environmental Protection Agency, Fish and Wildlife Service, Natural Resource Conservation Service, US Department of Commerce, US Energy Department, US Forest Service, and the Bureau of Land Management. Considerable risk and uncertainty exists when seeking approval and consensus from such a cadre of stakeholders. Historic flows in the Missouri River demonstrate that the river it a reliable source of supply for navigation, irrigation, and municipal supply. Flows vary annually and seasonally. The main stem of the Missouri River is managed by the Corps of Engineers pursuant to an annual operating plan that is focused on flood control, navigation, municipal water supply, recreation, and habitat for fish and wildlife. The historic Missouri River flood of 2011 caused significant river-bottom degradation from Atchison, Kansas to Kansas City, Missouri, breached numerous federal and private levees, and considerable damage to public and private property. A large diversion from the Missouri River would provide another means for the Corps of Engineers to control flooding of the Missouri River in the Kansas City reach. During periods of low flow, projected river diversions would be reduced or suspended. Subsequent water stored in reservoirs west of the diversion point could be released as needed to ensure adequate supplies of water for municipal use, such as along the Kansas River. The amount of electrical energy required for operations would be substantial and needs to be determined based on consideration of reasonable design alternatives. Power supply to the pumping stations would be provided by a combination of existing and expanded coal-fired power plants and wind energy as determined most appropriate and feasible by objective engineering and economic analyses. Additional water for Kansas and Colorado reservoirs will positively support reservoir recreation activities. The reuse project would likely have a positive affect on the riparian habitat of the lower South Platte River basin, particularly for whooping cranes and other waterfowl in northeast Colorado and southwest Nebraska. Potential impacts on endangered and protected fish and waterfowl along the Missouri River would need to be determined. Project alternative studies, engineering, design, construction, legal support, and operations would be a significant economic benefit to the States of Kansas and Colorado in terms of employment and population growth. A large diversion works, treatment plant, and pumping station would likely employ hundreds of skilled workers and engineers in Leavenworth County, Kansas. Pipeline and booster pumping stations would likewise employ hundreds of skilled workers across Kansas and eastern Colorado. Severance tax revenue for state of Kansas from the export of water to Colorado would also be significant. The economic benefit could be similar to the Keystone Pipeline from Canada to the United States or nearly any of the aqueduct projects in California. The project could also yield substantial volumes of new water to the Lower Colorado River Basin states under the Colorado River Compact.